Canalaska Ventures has defined fourteen anomalous zones. CanAlaska Ventures Ltd. (TSX.V-CVV: OTCBB-CVVLF) http://www.canalaska.com, Toll Free 1.800.667.1870, is pleased to report the first quantitative results from uranium exploration and sampling at the Company's North East Athabasca Project. This large project consists of 490,340 acres (1984 km2) and straddles the Saskatchewan-Manitoba border. Athabasca sandstone outliers to the west and south (Reilly Basin) indicate the strong possibility that this area was once covered by Athabasca sandstone. The North East Project exploration licenses cover the northern extension of the Wollaston Belt, which underlies all of the major uranium mines in the eastern Athabasca Basin. This summer the Company has carried out detailed lake sediment sampling over the entire license area, and is awaiting results on the majority of the 1,900 individual lake samples. Previous exploration work in the North East Project area in the late 1970s identified uranium boulder trains and uranium-rich lake sediments. CanAlaska's current program of surface follow-up and prospecting with a field staff of 15 geologists and prospectors has led to the discovery of new areas of mineralised boulders and outcrops. The Company and its shareholders are positioned for what CanAlaska believes will be the largest expansion in uranium exploration since the 1970s. Harry Barr, Chairman of CanAlaska has stated, ÂCanAlaska holds one of the largest uranium exploration portfolios in the Athabasca Basin and is actively exploring its propertiesÂ. 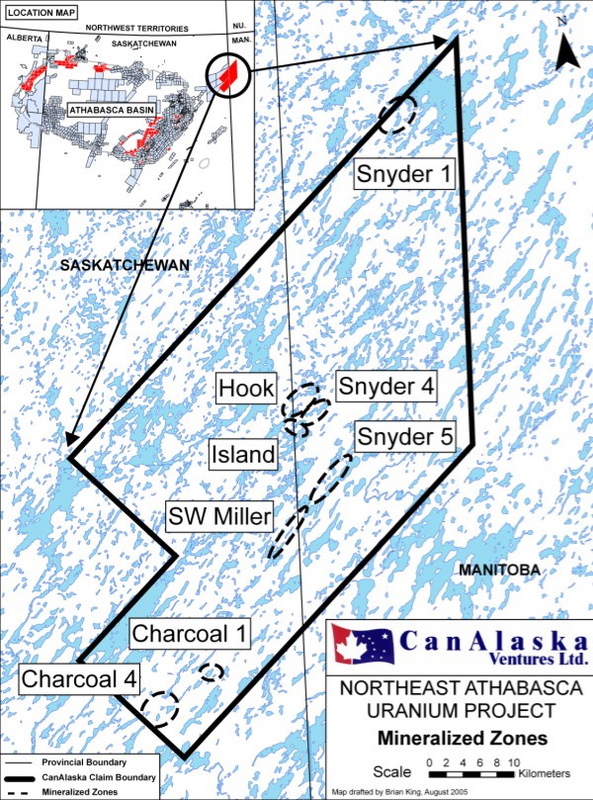 CanAlaska is a mineral exploration company concentrating on exploration for uranium in the Athabasca Basin of Saskatchewan, Canada, where the Company has recently assembled a large land package (over 1,650,000 acres). The qualified person for this release is Peter Dasler, P.Geo, President of CanAlaska Ventures Ltd. The TSX Venture has not reviewed and does not accept responsibility for the adequacy or accuracy of this release: CUSIP#137089108. This news release contains certain "Forward-Looking Statements" within the meaning of Section 21E of the United States Securities Exchange Act of 1934, as amended. All statements, other than statements of historical fact, included herein are forward-looking statements that involve various risks and uncertainties. There can be no assurance that such statements will prove to be accurate, and actual results and future events could differ materially from those anticipated in such statements. Important factors that could cause actual results to differ materially from the Company's expectations are disclosed in the Company's documents filed from time to time with the British Columbia Securities Commission and the United States Securities & Exchange Commission.